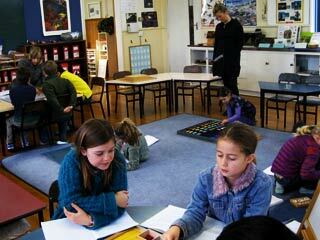 The Montessori approach is based on observing children in a prepared environment. An integral part of the enrolment process includes parent observations without your child. The children will have their own time to visit the class prior to acceptance into the programme. On entering the classroom you will notice a wide range of activities taking place at the same time. Observe in a context. Alternate between a wide angled view of the entire classroom as well as focussing on a particular child or group of children. Observe the activity level as it rises and falls. Notice how the children learrn in different ways and how they use the materials. Pay attention to your own reactions. How do you respond to the phenomena you observe? Note the way in which the children work. Do you see stress? Joy? Contemplation? If you are familiar with the Montessori Children’s House, notice the different behaviour patterns in the Primary student. Watch the way teachers interact with children. What seems to be the role of the teacher? What do you see as differing from the way you were educated? Listen to the teacher’s tone of voice with the children. How do children move from one activity to another? Observe the children’s relationships. How do they communicate? What social context do you observe? What do you notice about the structure of the environment? What other things do you observe?